As we discussed in Chapter 10, oceanic crust is formed at sea-floor spreading ridges from magma generated by decompression melting of hot upward-moving mantle rock (Figure 10.18). About 10% of the mantle rock melts under these conditions, producing mafic magma. This magma oozes out onto the sea floor to form pillow basalts (Figure 18.1), breccias (fragmented basaltic rock), and flows, interbedded in some cases with limestone or chert. Beneath the volcanic rock are layers with gabbroic sheeted dykes (which sometimes extend up into the pillow layer), gabbroic stocks, and finally layered peridotite (ultramafic rock) at the base. The ultramafic rock of the mantle lies below that. Over time, the igneous rock of the oceanic crust gets covered with layers of sediment, which eventually become sedimentary rock, including limestone, mudstone, chert, and turbidites. 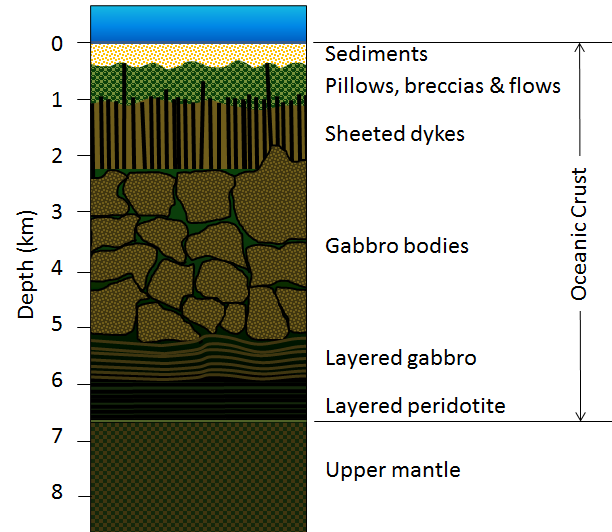 The lithologies of the layers of the oceanic crust are shown in Figure 18.6. The age of the oceanic crust has been determined by systematic mapping variations in the strength of the Earth’s magnetic field across the sea floor and comparing the results with our understanding of the record of Earth’s magnetic field reversal chronology for the past few hundred million years. The ages of different parts of the crust are shown in Figure 18.7. 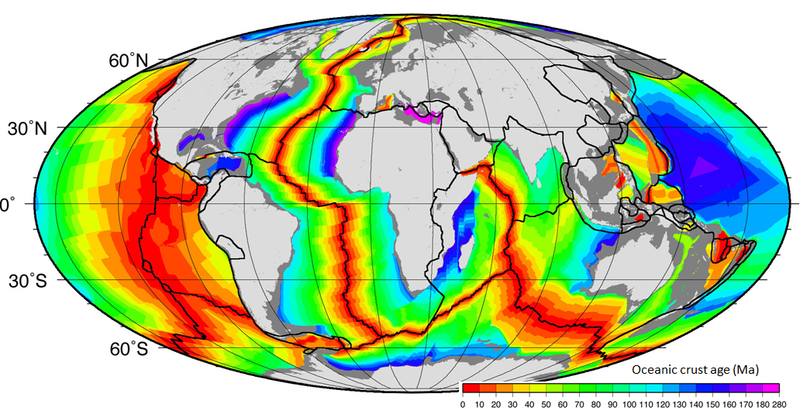 The oldest oceanic crust is around 280 Ma in the eastern Mediterranean, and the oldest parts of the open ocean are around 180 Ma on either side of the north Atlantic. It may be surprising, considering that parts of the continental crust are close to 4,000 Ma old, that the oldest sea floor is less than 300 Ma. Of course, the reason for this is that all sea floor older than that has been either subducted or pushed up to become part of the continental crust. For example, there are fragments of sea floor in British Columbia that date back to around 380 and 220 Ma, and there are similar rocks in the Canadian Shield that are older than 3 Ga.
As one would expect, the oceanic crust is very young near the spreading ridges (Figure 18.7), and there are obvious differences in the rate of sea-floor spreading along different ridges. The ridges in the Pacific and southeastern Indian Oceans have wide age bands, indicating rapid spreading (approaching 10 cm/y on each side in some areas), while those in the Atlantic and western Indian Oceans are spreading much more slowly (less than 2 cm/y on each side in some areas). 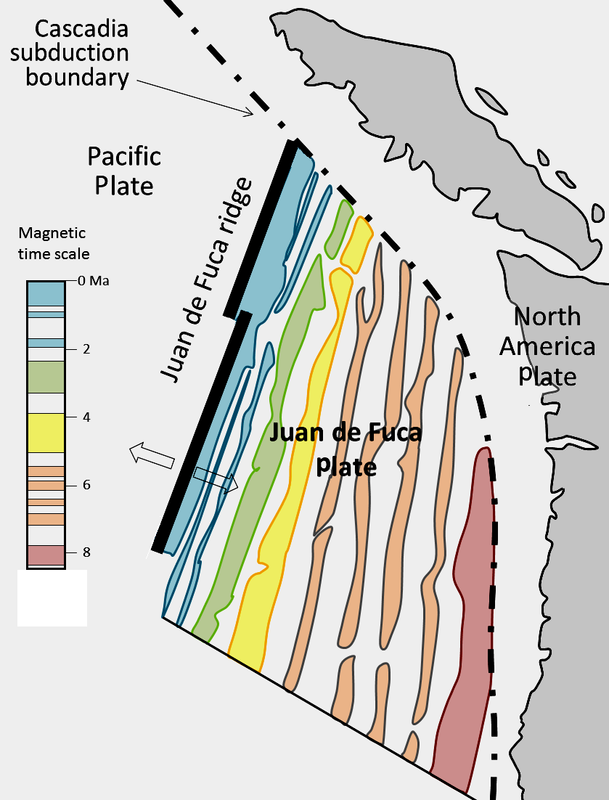 This map shows the magnetic patterns on the Juan de Fuca plate. The coloured bands represent periods of normal magnetism, while the white bands represent reversed magnetism. A magnetic-reversal time scale is also shown. 1. How old is the oldest part of the Juan de Fuca Plate that is subducting along the Cascadia subduction boundary? 2. How old is the youngest part of the Juan de Fuca Plate that is subducting? As is evident from Figures 18.2 and 18.3, the sea floor is dotted with chains of seamounts, isolated seamounts, and ocean islands. Almost all of these features are volcanoes, and most are much younger than the oceanic crust on which they formed. Some seamounts and ocean islands are formed above mantle plumes, the best example being Hawaii. The oldest of the Hawaiian/Emperor seamounts is dated at around 80 Ma; it is situated on oceanic crust aged around 90 to 100 Ma. The youngest of the Hawaiian lavas — at Kilauea Volcano on the island of Hawaii — is just a few hours old (or less!) and the island is surrounded by oceanic crust that is around 85 Ma old. All of the mantle-plume-derived volcanic islands are dominated by mafic rocks. Many seamounts are related to subduction along ocean-ocean convergent boundaries. These include the Aleutians, extending from Alaska to Russia, and the Lesser Antilles in the eastern part of the Caribbean. Some of the linear belts of volcanoes in the Pacific Ocean do not show age-distance relationships like the volcanoes of the Hawaii-Emperor chain or the Galapagos Islands. For example, the Line Islands, which spread out over more than 1,000 km south of the Hawaiian chain, were all formed between 70 and 85 Ma and are interpreted to be related to rifting. Most tropical islands have associated carbonate reefs, in some cases, as fringes right around the island, and in some cases, as barriers some distance away. In many cases, the reef is there, but the island that is assumed to have led to its formation is gone. The formation of fringing reefs, barrier reefs, and atolls is illustrated in Figure 18.8. The key factor in this process is sea-level change, either because of post-glacial sea-level rise, or because of subsidence of a volcano — as it is moved away from a spreading ridge — or both. If the rate of sea-level change is slow enough (e.g., less than 1 cm/year), a reef can keep up and maintain its position at sea level long after its parent volcanic island has disappeared beneath the waves. 18.2 The Geology of the Oceanic Crust by Steven Earle is licensed under a Creative Commons Attribution 4.0 International License, except where otherwise noted.